Looking to do my first few-month south-east Asia tour -- need reassurance! I'm looking to do a 3 or 4 month trip to south-east Asia this coming winter -- October to January, I think. I want to hit 4 or 5 countries properly, with some short stop-offs along the way. First, am I right in thinking that that's an ideal time to go? All of the countries seem to have slightly different rainy seasons, but October->January seems to be the best bet. Second, I want to do Indonesia and the Philippines. There isn't much info on them here on TravelFish -- does anyone have a good suggestion where to look? Or just some ballpark figures for how long I should spend in each country. Is Laos 'better' than Malaysia, Philippines, Indonesia? Don't all of those continental countries get a little 'samey'? I would've thought the archipelagos would be more interesting -- are Laos/Cambodia only must-sees because of their cultural heritage, or do they have vistas to rival the islands of Indonesia? I spent 5 months travelling through Indonesia, Cambodia, Thailand, Vietnam from Sept last year through to Feb this year. With the first 2 months spent in Indonesia (Bali, Lombok, Flores) - I experienced very little rain over this period. It was mainly a few afternoon downpours mid-late November in Lombok - the rest of the areas that I travelled in over this period were incredibly dry. Plan your Xmas/Jan time fairly carefully. This is peak season and you may want to avoid the more popular areas (eg Thai islands) as much as you can over this period. Even in Feb the islands in SE Thailand (Koh Tao and Koh Phangan) were fairly packed out - and I hate that! (It was much better in SW Thailand - eg Koh Kradan, etc. I can't comment on Laos as that was the one place that I didn't make it to. I saved it for my next trip! In response to your questions about aren't the various countries a bit 'samey' - I would say no. I think there are enough differences between them (food, culture, language, people, landscape) to make them all unique and interesting in their own right - particularly when you get out of the big cities and venture through the smaller villages. Vietnam was the real surprise for me. It was the country that I was most concerned about (thanks to all the horror stories of scams, ripoffs, aggressiveness, etc) - but it fantastic - and quite different to the other countries that I was in. No. 1 tip: don't over plan it. You have 3-4 months which is fantastic. Plan to cover 3-4 countries and to spend some quality time in each. Allow for some down-time to relax as well as days where you are on the move daily. Assume you will have days where you unexpectedly just want to 'hang' for a week or so. Have fun planning - I'm envious! Yup, anytime is a great time for a multi-month escape to SEA, but the time you'll be there should have the best weather and be a great way to avoid the northern hemisphere winter. Anyway, the only suggestion I have is that you work out what the visa regulations and options are for the different countries you wish to visit, to make sure you don't get caught short or at a border expecting one thing but getting another. Other than that, I think lizzy's comments above are spot on as always and a great way to get you started. Have fun. Yeah, the more I look into it, the more obvious it becomes that this won't be like any other trip I've done! Cool, re: Indonesia. I'm not too worried about finding things to do -- I'm just more worried about planning things from over HERE, in England. Anyway, next question (and I can see this one's been posed a few times): is Internet access available throughout every south-east Asian country? I'm sure it's prevalent in Thailand, but I don't want to carry a laptop through Laos or Indonesia or Philippines if there's no wireless! Related issue: I see that World Nomads only insure individual items up to £400? I will be carrying expensive photographic gear, so that's not really an option. Can I obtain a juicier World Nomads policy if I email them, or something? Will add more questions as I think of them...! I just returned a couple weeks ago from 9 months in SE Asia. I started in Thailand in September and found Thai Weather to be at its best (I was there on and off between September and May) between November and January. 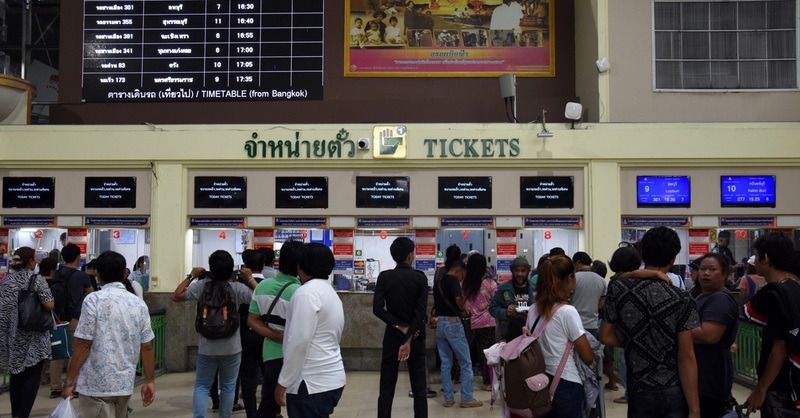 It started to get VERY crowded in most places in Thailand in december and heard from multiple friends that it wasn't nearly as bad in Laos and Cambodia during those times as it was in Thailand. If you are in Thailand during a rainy season, it really isn't as bad as it sounds. When I was there during rainy times, the rain isn't constant. I can't explain why but it usually seems to rain at about 4 o'clock every day for a while then on and off at nights, so we had plenty of non-rainy daytime hours. If you are looking for 'better country' or 'worse country' it's, as you are aware I'm sure, all relative. You can make generalizations though. I found many more people enjoyed Laos then Cambodia, and Thailand is an all-around favorite and Indonesia is off the charts amazing for it's variety of landscapes and activities. I found it much easier to find interesting side-trips in Laos than Cambodia, including a 3 day motorbike trip from Pakse (towards the South) to the Bolaven Plateau to see waterfall after waterfall as well as sleep at riverside guesthouses for cheap; and to Hongsa in the north by slowboat from Luang Prabang on the Mekong and more. If you want information about any of the 5 countries I visited (Thailand, Laos, Cambodia, Vietnam, Indonesia) please contact me, I really enjoy writing and speaking about my trip and I did keep a blog during my time there. I will tell you though, if you are having trouble finding more information about Indonesia, no need to worry, just plan it in. I thought the natural beauty of Indonesia was in a league of it's own, and finding activities there is unbelievably easy. I only spent a month there, and planned nothing in advance but did SO MUCH! I spent 6 days learning to surf between Kuta, Bali as well as Kuta, Lombok. I toured around Lombok on motorbike, took a 4-day boat trip to Komodo National Park to see the Dragons, I climbed Mt. Rinjani, the volcano, which erupted 5 times while I climbed it and took snorkeling trips. I never stopped doing incredible things until my visa ran out and had to leave. I LOVED it! As I said, feel free to contact me with any questions. WHen I planned my trip, I worked out roughly how long I would be in each country. I booked my flights from NZ to Bali, and from Bali on to Singapore (necessary for an extended visa). After that, I just organised flights and travel as I went. As exacto said, you need to be aware of Visa limits. I got a 2-month one for Indo, and a 1-month one for Vietnam. The others (Thailand, Cambodia, Singapore, Malaysia)I just organised the visa (or exemption, as the case may be) on arrival. Be aware than in Thailand you are allowed to stay for 1-month if you arrive by air; but 14 days if you arrive overland. You will need to plan around this accordingly. I think Thailand are still offering their free 2-month visas as well - in which case, it doesn't matter if you arrive by air or overland. So armed with this information, I roughly planned 1 month in the major countries I was visiting, and worked out my arrival/departure points so I had some idea of my travel path. I also worked out roughly the things I wanted to do within each country so that I had some sort of plan - but often didn't stick to it in the detail. Laos has power - I am sure you will be able to charge your batteries! The only places that you may struggle are on some of the smaller, remote areas. Honestly, in five months I can think of 4 places that had limited access to power (Kanawa island off of Flores, Koh Kradan and Koh Ngai in Thailand, and Otres, in Cambodia). I carried a netbook for photo backup, email access, Skype, music and the odd movie). There are big arguments about taking it/not taking it. I took it, didn't regret it, and would do it again. Sorry -can't help with Nomads question. I just took out travel insurance from a local company, and made sure that they covered electronics as well as medical (incl evacuations). Hey Breggs - sounds like you had an awesome time too! I did! Best time of my life! You mentioned the Thai Visa for 1 month on entry. If you go to a Thai Embassy in your home country before leaving you can get a longer one for free sometimes. They were offering free 4-month visas to Thailand for Canadians in 2009, to promote tourism I suppose, and am sure they would be offering some kind of deal like that now, seeing as how they need the tourist boost. As I alluded to, I'm a photographer -- and some of those Indonesian islands... man... some of those vistas look STUNNING. I'm not going JUST for photography though. The culture is just as important -- I want to absorb it all! It sounds like I could spend more than a month in Indonesia! It sounds like 3 or 4 months in south-east Asia won't be long enough... but as it's my first longer-than-a-month holiday, I think it's wise to try 3 months before I try 6... or 9! I'll go and find out if UK citizens have access to some juicy visa deals! OK, I've done a little research, and now I'm worried that it'll be too RAINY in Indonesia between October and January. I'm sure it won't be cold, but will the rain be an issue? Well, like I said, I was in Bali/Lombok/Flores from mid-Sep to mid-Nov, and had very little rain until the last two weeks. And even then, the it was just a downpour for an hour or so in the late afternoon. It really wasn't a problem. But I guess the more remote you are, the more problematic it could be - for example, road conditions in remote mountainous areas could become treacherous. One thing about Indonesia - don't understand the travelling times. It may only be 100km according to the map, but soemtimes it can take you all day to go that distance! It's been 20 years since I was in Sulawesi, and even then, I only did one corner of it. You will find that you might need to spend one month there alone due to distances, travelling times, roads and transport availability. Track down SBE on this form - she has had lots (and recent) experience in Sulawesi. You will have an endless of supply of photo opportunities! I would strongly suggest going to Flores - you can see Kelimutu volcano (3 multi-coloured crater lakes) and visit the Komodo dragons on Rinca island.